Additional photos of the 2015 Ford Mustang have reached the web, as TIME Magazine has just posted new exclusive images of the car. This comes after the first official 2015 Mustang photos were leaked yesterday on the web thanks to scanned images of an Autoweek cover and article. The trio of images from TIME show two clear front 3/4 views of the car, one inside a building and another outside, plus a tightly cropped interior shot revealing the steering wheel and gauges. They are the clearest view we have yet of the new 2015 Mustang. Unfortunately no new details were revealed in the brief article. Ford will officially reveal photos and details of the 2015 Mustang in just a few hours, so stay tuned for the floodgates to open. 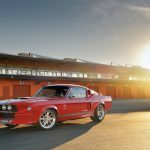 This entry was written by by Drew Phillips (Mustangs Daily) and posted here on Wednesday, December 4th, 2013 at 4:45 pm and is filed under 2015 ford mustang, 2015 ford mustang photos, 2015 mustang, 2015 mustang photos, News. This article was not written by us, rather gathered using RSS feeds listed here. We take no credit for this article. You can leave a response, or trackback from your own site.